How to enable Performance Point Services? In this post I would take you through enabling Performance Point Services in SharePoint 2010. What is Performance Point Services? The infrastructure is provided through service applications, a set of site/site collection features & associated web parts. Additonally, the “Business Intelligence Center template not found” problem can be solved after enabling Performance Point feature. What is the site template for creating Performance Point site? The site template Business Intelligence Center. Is the template available by default? The features should be enabled in the site collection & site level. We need to provision the Performance Point Services in order to enable the feature. You might need to configure the Secured Store services as well. Open the Site Collection Features & Activate the following features. Repeat the same for Site Features as well. You can try creating a new site from template Business Intelligence Center. In this article we have explored how to enable Performance Point Services in SharePoint 2010. In this article we can explore a real life scenario of refreshing Content Query Web Part programmatically. How to achieve the same? What is Content Query web part? Create 2 project sites of template Team Site & add some tasks into it. Make sure you remember the URLS. 5. Replace the Page Load event with following code. 6. Add the following method for button click event handler. 7. Ensure you have the following namespaces included. 11. Insert the Project Buttons web part to the home page. It looks like below. Now we can insert the Content Query web part into the home page. Open page in edit mode & insert web part from the Content Rollup group as shown below. Edit the web part & make the Presentation > Link property as empty. Now click on the Project 1 button & you should see the Content Query web part updated with tasks. Now click on the Project 2 button & you should see the tasks changed with Project Site 2. 4. Now on clicking the button, the content query web part will display tasks list from the corresponding project site. In this article we have explored a typical real world scenario of refreshing a web part from another web part. 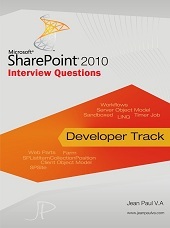 I hope this will be useful to you in SharePoint development. Following is the PowerShell Script which performs the same. You can verify the new content database through Central Administration > Main Page > Manage Content Databases link. The same PowerShell script will be added to www.sharepointcto.com PowerShell Repository. Please give me some time to do it. In this article we have explore the PowerShell script to create new site collection with new managed path & content database. I hope this will be useful for site conversion activities. How to Delete a Managed Path? Imagine that you created a wrong managed path. How to delete it? In this post, I will show how to delete a managed path using Central Administration. Select the path, then click the Delete selected paths link from the top. Your link is deleted. In this post, we have explored how to delete a managed path. In this article I would like to reveal the advantages of Content Type in real world scenarios. A content type is a reusable collection of metadata (columns), workflow behavior and other settings for a category of items or documents. We can manage Content Types through the Site Actions > Site Settings > Content Types page. Reusability: We can create a content type & reuse across the site. For example, we can create a content type named Expense & reuse it in multiple departments like HR, Marketing, Research etc. Additional to columns, we can reuse the workflows, custom forms associated with Expense content type. The reusability feature helps in reducing time effort in creating redundant items. Standardization: Content Type allows quick standardization of items through definition in one place. Centralized Control: We can apply changes to existing content type & the associated list or library will reflect changes automatically. For example, if we add a Description column to the above Expense Content type, the change will be reflected in all associated libraries. Another example, we can create custom new/edit forms for a content type & the changes should reflect everywhere. So, quick standardization is possible through content type. Default Content Type: We can add a new content type to a library or list & make it default. Default Content Type will be invoked while using the Add Document or Add Item links. Multiple Associations: We can associate multiple content types to a list or library. For example a Project Library can have different content type associated like: Plan, Expense, Meeting, Discussion etc. In the appearing page, click the Create button. You should get the screen below to enter the Content Type detail. You can create a content type inheriting from existing content types like Item, Document, Folder etc. For the time being, please select the Item content type from List Content Types group. Enter the name of new content type as Expense. Click OK button to save changes. You can see the new content type created in the content types page, make sure you check under the Custom Content Types group. You can edit the above Content Type & add remaining columns Amount, Date & Person. Open an existing List & choose List Settings. From the Advanced Settings, check the option Allow Management of content types. Coming back to the List Settings page, choose the Add from existing content type link. In the appearing page, you can select our Expense content type & click the Add button. After clicking Add button, click Ok button to continue. Now you are ready to use the new content type. Go to the List, click the New drop down, You can see the Expense item listed there. We can make a content type as Default which will set the New command to the specified item. On clicking the Expense item, you can see the dialog box with Expense fields. Please note that wise usage of Content Type, in the long run, should save Time, save Effort and increase Quality of Content Management. In this article we have explored Content Type, Advantages, Creation and Association. In this article I would like to demonstrate association of Metadata with a Library. This article assumes that you already have Terms created using the Term store management tool. Now you are going to associate the same with a document library. For creating Term Set, please contact the appropriate site collection administrator. In the appearing page enter the column name, Term for example & choose type as Managed Metadata. Scroll down the page & from Term Set Settings section, choose the Term Set. Good! You are ready with Term Set associated with the library. Now you can try entering data along with the Term. Try uploading a new document to the library & you will be prompted with the term input. You can select the term from a dialog, or type for auto-completion. After saving the changes, you can see the term in the list view. Associating Terms along with document, items improve the Content Classification resulting in improved search, key filters. In this article we have explored how to associate metadata with a Library. In this article I would like to explain a problem I faced after import & the solution. I was converting a site to site collection using PowerShell commands. Please note that the URLs are same in this case. Error Message: This page is not using a valid page layout. To correct the problem, edit page settings and select a valid page layout. This is a bug within Exported Sites where the parent site layout master-page url is hard-coded inside the publishing page. There is no way to change it through SharePoint user interface. In my case the first 2 options did not worked, then I downloaded the file, modified it, uploaded back & the problem was resolved. Now upload the file back to the same library & overwrite existing one. Make sure you check in the changes. Now go back to the browser, clear the cache & retry the problem sub site. This time you should see the Page is working correctly. You need to ensure that the Publishing feature is enabled in the newly created site collection & site. Additionally make sure the master pages are valid. You can see master pages through url _catalogs/masterpage. In this article we have explored a possible After-Import problem & the Solutions. I was working on a site moving, but the operation failed due to site template mismatch. I ended up with a half-created site. I can access the site through URL, but unable to access the site settings to delete the site. I tried PowerShell Remove-SPSite approach, but it says it cannot find the site with url. I tried to examine the problem using Squadron. Luckily i was able to see the site there. Then the rest is easy – created on Delete command which recursively delete sites & sub sites under. It worked like a charm with Squadron. Here are the steps involved to delete a site collection/site/list/library using Squadron. Open the Explorer plugin from the left pane. Great! Your defective site should be deleted now. SharePoint 2010 – How to get Farm Servers through code? Following is a typical output from a Server Farm. Here we are using Server Object Model code to retrieve the farm information. For getting Farm instance, we can use the SPFarm.Local property. For iterating through the servers, we can use the Servers property of Farm object. For retrieving the Name, Role, Type we can use the instance properties of SPServer. We can always retrieve this information from Central Administration as well. The console application source code is attached. In this article we have explored the C# Server Object Model code to retrieve Farm Server Information. In the real world scenarios we can use this information to quickly understand the server topology. Error :: Cannot start service UserCodeV4! Scenario: While deploying solutions using Visual Studio, we may encounter the following error. Description: The service mentioned here is SharePoint Service, not Windows Service. You will get the following page of SharePoint Services. Among the services locate the Microsoft SharePoint Foundation Sandboxed Code Service, it should be having status Stopped. Click the Start button to restart the service. Now, back in your Visual Studio try Deploy operation again. You should succeed this time.